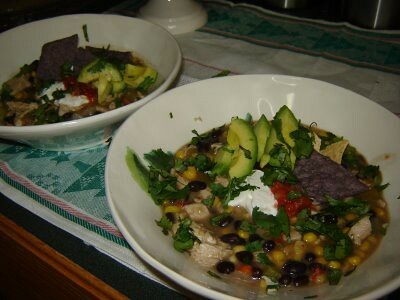 I was inspired to make chicken tortilla soup one cold and rainy night this week. 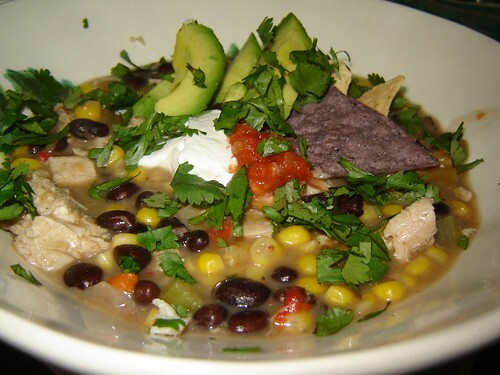 I had most of the ingredients on hand to make the base for a soup, and just added some of hubby’s and my favorite “Mexican” ingredients. It turned out wonderfully. In a large pot, melt butter over medium heat. Add celery, carrot, and onion. Season with salt and pepper. Cook over medium heat until veggies begin to soften, about 5 minutes. Sprinkle flour over the vegetables, and stir. Flour will form a paste; allow paste to cook for at least 2 minutes. Gradually add chicken broth, whisking. Heat the mixture until it begins to simmer and thicken, approximately 7-8 minutes. Note: At this point, you have the base for pretty much any chicken soup you want to make! 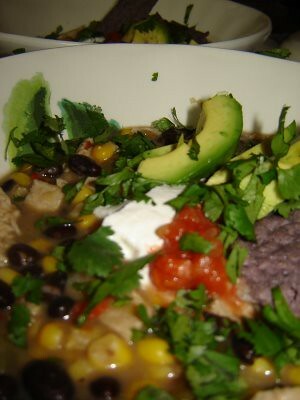 Add mexicorn, beans, green chiles, and garlic. Mix and return to a simmer. 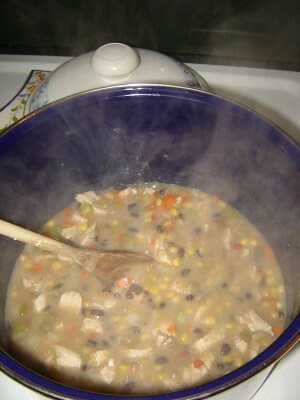 Add cooked chicken and spices, seasoning the soup to taste. Simmer over low heat, covered, for 20-30 minutes. After flavors have had time to meld, the soup is ready to eat! Serve with your favorite garnishes and enjoy!